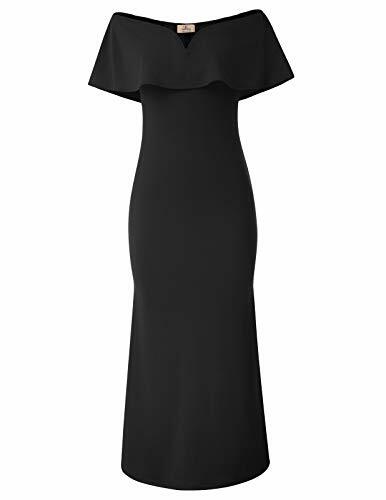 GRACE KARIN Women's V Neck Off Shoulder Ruffle Evening Party Bodycon Maxi Dress The bridesmaids bodycon dress that features off shoulder design provides an edgy, bold look and can still be delicate and feminine. With flouncing ruffles,Medium stretchy fabric in body-hugging silhouette, V neckline that makes you be more glamorous and elegant. The slim fit dress is perfect for formal events, cocktail, party, prom, homcoming. Size 2XL:Fit Bust 44.5~46 inch, Fit Waist 36.5~38 inch, Fit Hips 47~48.5 inch, Length 150cm/59 inch; Notice: 1. Size table is for reference only! Manual measurement will have 2-3cm error range. 2. Factors such as lighting, contrast and color display can cause the photo to look different from the actual product.